Jonathan – Has Fitzmagic pulled a Houdini on the Buffalo Bills? After Ryan Fitzpatrick signed a six-year extension for $59 million, he’s struggled to duplicate his early-season numbers. Look at his first seven games compared to his last seven. Some of the blame can be attributed to a banged-up offensive line and an injured Fred Jackson, but these are not the type of numbers the Bills were expecting from their 60-million dollar man. The financial impact of Fitz’s contract could also take the Bills out of the running to re-sign Steve Johnson once he hits the free-agent market next year. Contract talks between the Bills and Johnson broke down a few weeks ago, and he could command high dollars as one of the top free-agent wide receivers in 2012. One bright spot for the Bills is the recent play of 2010 first-round pick C.J. Spiller. After a lackluster rookie season, Spiller is seeing more time on the field due to Fred Jackson’s injury and has looked good in his last few starts. Against Miami on Sunday, he showed the receiving skills and speed the Bills coveted when they drafted him 9th overall. Spiller rushed for 91 yards, caught 9 balls for 76 yards and scored on a 24-yard run and a 3-yard reception. Dave – The Ravens were roasted in San Diego last night, 34-14. It was their fourth loss of the season. All four have come against teams that are .500 or worse. Maybe if the 7-7 Chargers hadn’t lost six straight in the middle of the season, Baltimore would have won. After all, they are 6-0 against teams with a winning record. Fortunately for Ravens fans, Baltimore will only play teams with winning records in the playoffs. 1) Who would’ve thought the Chiefs would beat the Packers? 4) What a perfect ending to the day. Ravens lost!! If the Steelers win tonight, they’ll be first in the AFC North and have a chance to get the 1st place seed in the AFC. Bring on the 9ers! Nick – The Jets and Giants have both had miserable games this season, while also winning games in impressive fashion. Fans of both teams can’t help but feel frustrated and hopeless, but the season is not over yet. 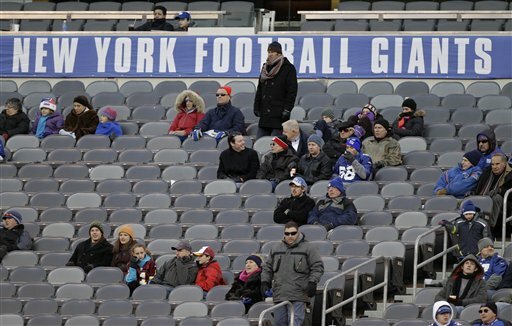 The loser of the game this Saturday at The Meadowlands probably will be eliminated, making for a playoff atmosphere between the two New York teams. Fans of both teams are hanging on by a thread, desperate for a win. This game is essentially the last chance for either team to save its season.